Mr Whyte believed that its dedication to Our Lady went way back, probably before Liberton parish was given to St. Cuthbert in the 11th or 12th century (whose own holy well could once be found several miles north, near Leith). Generally, wells that are dedicated to ‘Our Lady’, refer to the Virgin Mary; but prior to any christian affectation, the animistic genius loci of the waters would have been a local spirit. 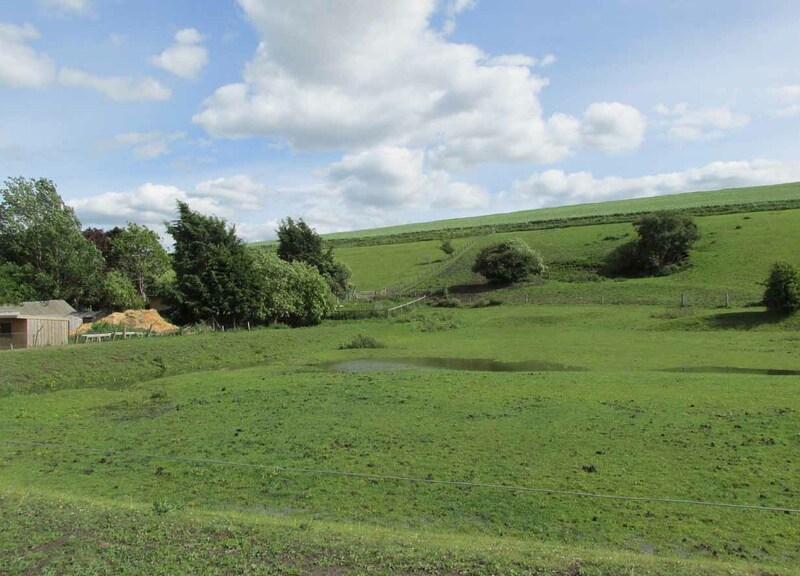 Although this holy well was shown on early and late 19th century OS-maps as ‘covered’, trying to find its exact position today has proven difficult. When Paul Hornby and I visited the site after some heavy rains in June, 2017, we found a large pool of water in the field exactly as shown on the old map. 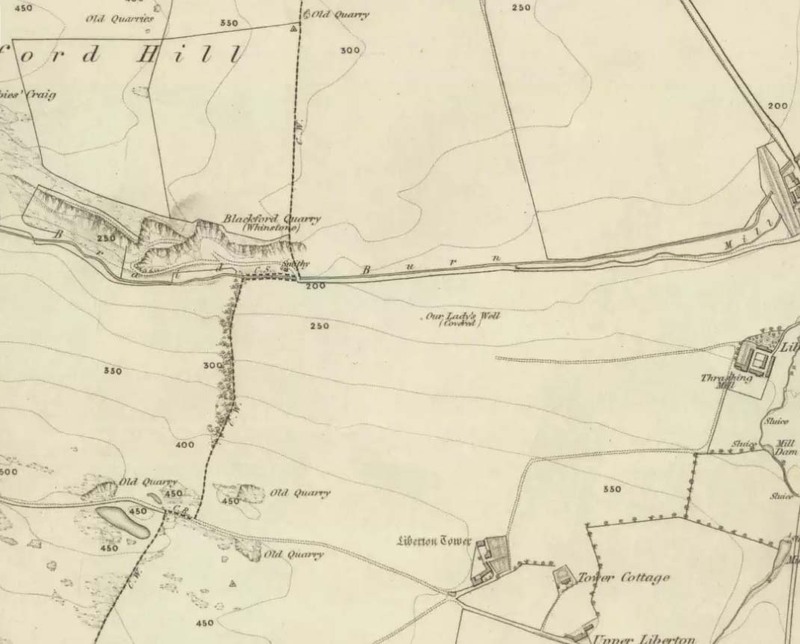 This was, however, misleading, as the owner of the land and the Blackford Glen Western Riding school—a Mr John Fyfe—told us that they had, for years, always wondered about its exact position, but been unable to ascertain it with any certainty. The pool in the field always appeared after the rains, he said. He did tell us however, that many years ago when he was digging in order that the Braid Burn stopped flooding his property, he came upon a length of ancient piping running in the direction of the burn, some 5 or 6 feet down, whose use he could not ascertain—but which might have once conducted the waters from the Lady Well away. No water was running through it though. Near the middle of Liberton village a century or so ago, another holy well of the same name could once be seen less than a mile to the east. Bennett, Paul, Ancient and Holy Wells of Edinburgh, TNA 2017. Good, George, Liberton in Ancient and Modern Times, Andrew Elliot: Edinburgh 1893. Walker, J. Russel, “‘Holy Wells’ in Scotland,” in Proceedings of the Society of Antiquaries of Scotland, vol.17 (New Series, volume 5), 1883. Whyte, Thomas, “An Account of the Parish of Liberton in Mid-Lothian, or County of Edinburgh,” in Archaeologia Scotica, volume 1, 1792. Acknowledegments: Huge thanks to John Fyfe and his wife for their help when we were exploring this site. Occultist, prehistorian and independent archaeological researcher, specializing in prehistoric rock art, Neolithic, Bronze Age & Iron Age sites, and the animistic cosmologies of pre-Christian & traditional cultures. This entry was posted in Holy Wells, Midlothian, Scotland and tagged animism, antiquarian, antiquities, Archaeology, christianity, Craigmillar, earth mysteries, Edinburgh, healing wells, heritage, holy waters, Holy Wells, Liberton, medieval history, midlothian, sacred sites, Scotland, St. Cuthbert, St. Mary, Virgin Mary, water. Bookmark the permalink.